Mother knows best: Norm Thompson was excited. It was picture day at training camp, and he had been working on his 'fro all spring and summer, trying to look like his idol, Oscar Gamble. Thompson was about to grab his keys and head to practice when a knock came at his door. He opened it to find his mother, hands on hips, foot tapping, with a menacing look on her face. Mrs. Thompson grabbed Normie by the ear, marched him into the bathroom and handed him a comb. "You're not going to practice looking like that," she scolded. "Now get to combing!" Thompson spent the next 30 minutes transforming his afro into the hardest part since Adolf Hitler's. 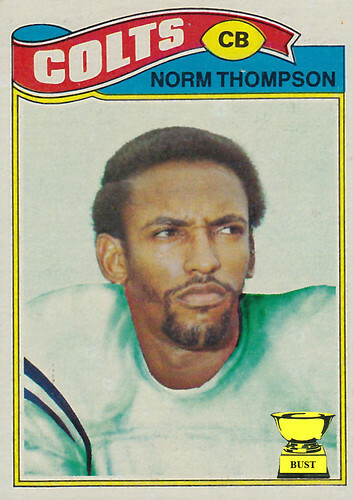 The only thing that hurt worse than his scalp that day was the mocking from his teammates — and the Topps photographer. I think this is an impostor. He's standing behind one of those wooden fake fronts you put your neck into to have your picture taken at the carnival.